A few weeks ago, Emily reminded me that she had a holiday week coming up and asked if I was ready for our road trip. You see, a few months ago, while I was in the thick of working on my book project, I failed to join her and others on an extended trip to Cameron Highlands. I was deeply disappointed to miss out on that trip but she assured me that we would go on our own road trip later. That 'later' was going to happen! So I replied with a resounding, "Yessss!!" We agreed that our road trip was to be a free-and-easy outing with no particular itinerary but I only had to be in Kuala Lumpur on the weekend of Oct 15 because I was going to watch the 200th performance of Emily of Emerald Hill. With that in mind, I let Emily plan the route from Johor Baru to various Johor towns that we were not as familiar with, including a detour to KL, before we continued exploring Johor. While she did the research and made the hotel reservations, Emily also reminded me of the must-see and must-do items in the various Johor towns. She was an excellent navigator and sign-reader who helped us to reach our destinations smoothly. It was such a relaxed yet exciting trip where we met interesting people, captured some charming photos and had some very pleasant surprises too. But more about our experiences and explorations later. Always have time for some retail therapy! We talked about everything and nothing. We sang and we laughed and cried. We made many memories. Look out for more on our road trip! When I was invited to a restaurant that serves Sulawesi cuisine, I prepared my palate for a taste of exotic Indonesian dishes that was typically chilli-hot and spicy. Sulawesi, formerly known as the Celebes, is an island in the Republic of Indonesia, so I guessed their cuisine should also feature seafood and I was right. Simply known as Sulawesi Cuisine, the restaurant not only has a menu of seafood, it is also popular for a selection of chargrilled items that uses coconut shells for fuel, in a dining concept created by Pak Boetje Bawole, the owner of a chain of similar restaurants in Indonesia. This outlet at Taman Mount Austin is located in a corner shop with a spacious dining area on its ground and first floors. From a distance, I could see spires of smoke from an open grill by the side of the building where a kitchen staff was cooking. When I arrived, I saw Bryan Ong, helping to serve diners. He looked like a very hands-on manager who didn’t mind lending a hand in the restaurant, especially during busy dinner hours. Diners who have discovered their interesting menu, have made reservations and I saw tables joined up into a long banquet for them. One group was already seated and dining while another long table had a ‘Reserved’ sign on it. It was not long before guests arrived and this table was also occupied. I was glad there was still a table to accommodate my family of eight and after welcoming us in, Bryan passed us the menus while he continued to help out with the serving. Later he told me that they happened to be shorthanded that day. As we browsed through the pages, I noted that it was helpful that items were highlighted with an icon for Chef’s Recommendation. The menu introduced diners to Sulawesi cuisine and provided a guide to select the types of fish and pick from the recommended cooking style – whether fried whole or fried sliced fillets – as well as in various flavours. I’m pleasantly surprised that even the names of the fish sounded exotic! One may choose Goreng Polos which means, Original, Just fry it! Or in choices of Goreng Telor Asin (fried in salted egg), Saos Asam Manis (sweet and sour sauce) and Saos Mangga (Sulawesi mango sauce). Finally, Bryan recommended Kudu-Kudu or Box Fish also known as ‘Helicopter Fish’ – a species of fish found in abundance in the sea surrounding Sulawesi, prepared in Sulawesi mango sauce. When this was served, we discovered that a ‘box’ of meat was hollowed out from the fish. This was cubed and coated in batter before being deep-fried. Then mango sauce and slivers of fresh mango were added to the fish meat and served in the hollow ‘box’ within the fish! He also suggested we tried their signature charcoal grilled fish and helped to pick Sukang, a leather jacket fillet fish, prepared in two sauces – Rica-Rica, a signature hot and spicy mixture, and a milder Kecap Manis, a popular Indonesian sweet soy sauce. He explained that the two-flavour fish would usually be served seasoned with one flavour each on each side of the fish but for my photography purposes, he would serve the two flavours more visibly with the Rica-Rica sauce on the head and the Kecap Manis on its tail. One of my all-time favourites is satay and here these skewers of grilled marinated tender chunks of meat are called, Sate and they are served in three meat choices – ayam (chicken), sapi (beef) and kambing (mutton). It was interesting that our chicken and beef satay was served on a grill with two types of dip sauce, a spicy peanut sauce and a Kecap Manis (sweet soy sauce). Another of my favourites is eggplant and here, the slices of terong (eggplant) were grilled and topped with spicy Rica-Rica sauce. I was glad that not all dishes here were hot and spicy. We savoured Chinese-style stir-fried vegetables like kangkung belacan and prawns in salted egg sauce. Jus Alpukat was recommended to help cool off after a tasty meal. This was a delicious blend of fresh alpukat or avocado flavoured with Gula Melaka or palm sugar. Two popular choices of desserts here are Lychee and Vanilla Ice-cream drizzled in coconut milk and Gula Melaka, and a refreshing mixed fruit cocktail with chin-chau (grass jelly) and shaved ice. This somehow reminded me of the reverse of an Air Batu Campur where there was more condiments than shaved ice! Sulawesi Cuisine is at No. 55, Jalan Austin Heights 8/8, Taman Mount Austin, 81100 Johor Baru. Banquet and private event facilities are available. For reservations, Tel: 607 – 361 0907. I smiled when I read the details printed on the Exclusive Invitation I received for the grand opening of the Impiana Hotel Senai. The event was planned for 10am on October 1o. I thought 10-10-10 was such an auspicious collection of numbers! Senai is no longer a small town and the time is ripe for a business-class hotel to open here. It is home to Johor Baru’s airport and close to industrial parks as well as award-winning golf courses and a popular shopping destination like Johor Premium Outlets. As Senai International Airport increases the number of international flights, more international tourists are expected to arrive and depart through this airport. For overnighters or short-term stays, this hotel will provide tourists and business travelers with the service quality they are familiar with. So early that morning of 10-10, I made my way to the hotel to arrive before 10am but I was still later than many early-birds. As I drove pass the hotel to make the U-turn from the highway to the entrance, I spied a troop of lion-dancers alighting from their transport and others guests milling around the fountain at the porch. As soon as I parked, I quickened my steps and headed into the lobby. The decor in The Tiffin - decorated by tiffin carriers! If I looked beyond the rows of congratulatory bouquets and throng of guests, I could see the comfortable lounge seats that dotted the spacious lobby. At once, I was enveloped by the melodious sounds of a string quartet that was performing ‘live’ somewhere nearby. I spotted a few familiar faces and one of them broke away from his conversation and approached me with an extended hand. He was hotel general manager, Tengku Faizal, and I shook his hand to express my congratulations on the opening of the first business-class hotel in Senai. At once, he suggested a hotel tour and handed me over into the capable hands of a hotel team member, who led me to the lobby level restaurant named, The Tiffin. I enjoy tiffin and I like tiffin carriers! And I thought it was rather apt to name a restaurant after a light-midday meal. While it is an English practice, this dining culture was taken to greater heights in India. When I lifted my eyes in the restaurant, I was charmed by the sight of a variety of tiffin carriers – low and tall ones, mostly vintage types – that decorated the shelves above the serving counter! After I had my fill of admiring the tiffin carriers, I was led to a bank of elevators. From the panel of buttons inside the elevator, I realised that it was a low-density hotel with the highest floor at level 9. I was also pleased to see that the hotel has a keycard security system for guests’ added peace of mind. Our elevator ride was not long but in a few moments, I suddenly noticed that this elevator does not have a level 4! There was ample time for a quick tour before the Guest-of-Honour was due to arrive so we made good use of the time to explore the various locations to view the infinity swimming pool, the gym and spa [yet to be opened], club lounge and guest rooms. After the brief tour we returned to the lobby and I saw how the crowd seemed to have swelled almost double the number of people. There seemed to be hardly any standing room left. The music of the string quartet was a welcome relief and I was drawn towards them like a magnet. A sofa was placed almost directly in front of the musicians and a gentleman was seated on one end, clearly enjoying the music. It was only natural for me to join him on the sofa to enjoy the music created by two violin players, a viola player and a cellist. We sat in silence, just appreciating the music by this ensemble. People were still milling about but we just escaped into the music. I don’t remember who started speaking first but we chatted briefly about the beauty of chamber music. While I don’t play any musical instrument, I confided that my dad took up playing the piano after his retirement. I told him my dad had an ear for music and he used to play a banjo-mandolin in his younger days. But to play the piano, dad even went to Yamaha Music School for a basic course to learn to read music. Soon he was playing his favourite pieces from memory! After chatting for a bit, we introduced ourselves and he said his name is Farouk. When Tengku Faizal passed by, he paused with a comment, “I see, you’ve met” or something to that effect but I didn’t give it much thought. I had already introduced myself as a friend of the hotel as I was going to do a review when the hotel was ready. There was a flurry of activity that signaled the impending arrival of the Guest-of-Honour, Chairman of Johor Executive Committee for Tourism, Trade and Consumer Association, YB Datuk Tee Siew Kiong, so I excused myself to join the welcome at the porch. By then, I realised that the distinguished gentleman I was chatting with about music was none other than the Executive Chairman of Impiana Hotels & Resorts Management, Yang Teramat Mulia Dato’ Seri Ismail Farouk Abdullah. And there he was standing in line with the Guest of Honour and other distinguished guests to officiate the opening of the Impiana Hotel in Senai. Congratulations Impiana Hotel Senai on your official opening on 10-10-10! P.S. Tomorrow, Oct 26, would be dad’s 95th birthday if he was still with us. Happy Birthday, daddy. I still miss you, dearly. While planning a birthday lunch for the October babies, my former classmates asked around the group for a choice of food to enjoy together and they agreed when I suggested Mampir Lagi. This cosy café in Taman Pelangi serves Indonesian cuisine and as most of them have not dined there, everyone were keen for an exotic dining experience. I am acquainted with the couple, Jason Antoney and his wife, Henny Lumintang, who run this café and was happy to help place the reservation for our lunch appointment. I suggested having their set meals to share among us and looked forward to introducing the taste of Lombok to my friends. Henny, who hails from Lombok, had been running this café with the help of her husband since last year and her Indonesian recipes have been drawing me back again and again. And her mouth-watering cakes are also ideal for dessert! 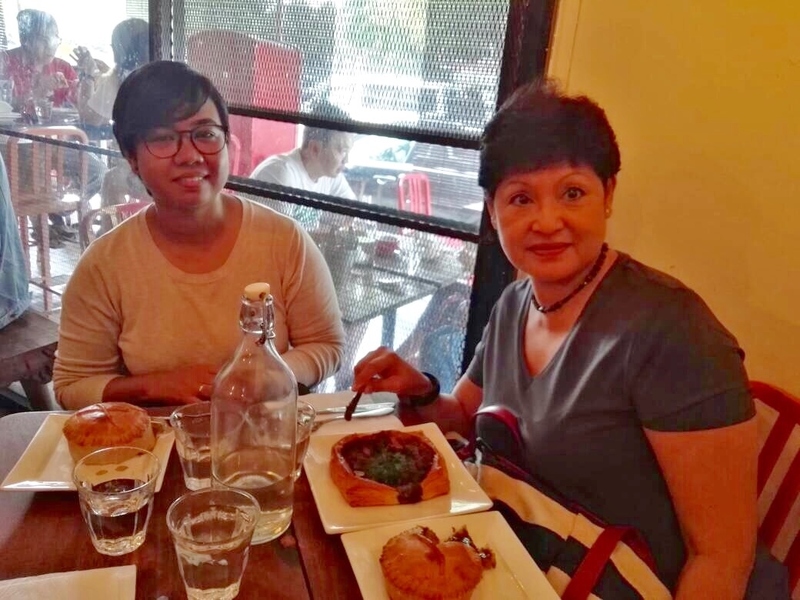 A few days after I made the reservation, Henny sent me a photo of my book, My Johor Stories: True Tales, Real People, Rich Heritage, with a request to please autograph it for her when we came for lunch on that appointed day! I was pleasantly surprised and deeply honoured by her request. In my last visit to the café, Jason told me how he was reading my book and enjoying it. He described that it was simply, un-put-down-able! So on that day, ten of us gathered for the October birthday celebration at Mampir Lagi. We ordered one each of their set meals – A, B and C – so that there were ample dishes to go around. There were also two whole fried fish with two types of dip sauce, to share among us! I also placed an additional order for Gado Gado which is presented slightly different from those served elsewhere. It was good to see how everyone relished the taste of the various Indonesian dishes with white rice and polished off the plates in a leisurely meal. My only regret is on that day, their special item for the day was not Oxtail Soup. I tasted its rich, aromatic flavour in my previous meal at the café and longed to share it with my friends. While it was a minor disappointment, this just means we have to return to the café again when it is available! The birthday girls (us!) were given the privilege to pick our choices of cake from the chiller and so Irene, Elizabeth and I chose one wedge each of Henny’s delicious Red Velvet cake, Carrot Cake and a slice of tangy Lemon Tart. With candles lit up on the slices of cake, there was the obligatory singing of the Birthday Song for the October babies. Henny also bakes plain butter cakes and these are served without icing or decoration. That day, a batch was freshly baked and I was impressed when she happily served a few slices to our table, with her best compliments! Other diners came in and left but our group still lingered, enjoying each other’s company and savouring the cakes with freshly brewed coffee and tea. As Jason brewed the beverages and Henny served her cakes, it felt as if we were being entertained in their home. When the crowd thinned and Jason and Henny were not too busy, I excused myself from the table and went to join them – both patiently waiting with my book. It was my pleasure and privilege to autograph it for them and Jason – who confessed that he was not much of a habitual reader – told me that even his wife noticed that he was too engrossed with reading my book! Thanks, Jason and Henny, for your kind hospitality at Mampir Lagi and for your interest in my book, My Johor Stories: True Tales, Real People, Rich Heritage. Happy Reading! The incomparable Pearlly Chua is best known as the actress who effectively portrayed Emily Gan, the key character in Emily of Emerald Hill, a play written by Singapore playwright, Stella Kon in 1982. I had read reviews and saw news snippets about this monologue drama where the entire performance hinged on the talent and versatility of the actress. And for a long time I wanted to watch Pearlly Chua perform this dramatic role but the opportunity never came. Around mid-July, Sulaiman Yahya invited me to the staging of this play in Kuala Lumpur with Pearlly Chua in the role, to celebrate her 200th performance on Oct 15. Wow! To watch Pearlly Chua reprising her role for the 200th show? It was indeed a significant milestone and I wanted to be part of it. At that time, I did not know where or what time it was being staged (he did not give details yet!) but I assured Sulaiman that I will be there. And I was. When I received the relevant info, I was amused that the show was being staged at The Play Haus, a theatrette located within the Pearl Shopping Gallery. Pearlly at the Pearl… how uncanny was that? Sulaiman said the show should start at 8pm but prior to it, guests were welcome to refreshments of coffee and tea with an assortment of Nynoya kueh. It thought it was so charming and appropriate! 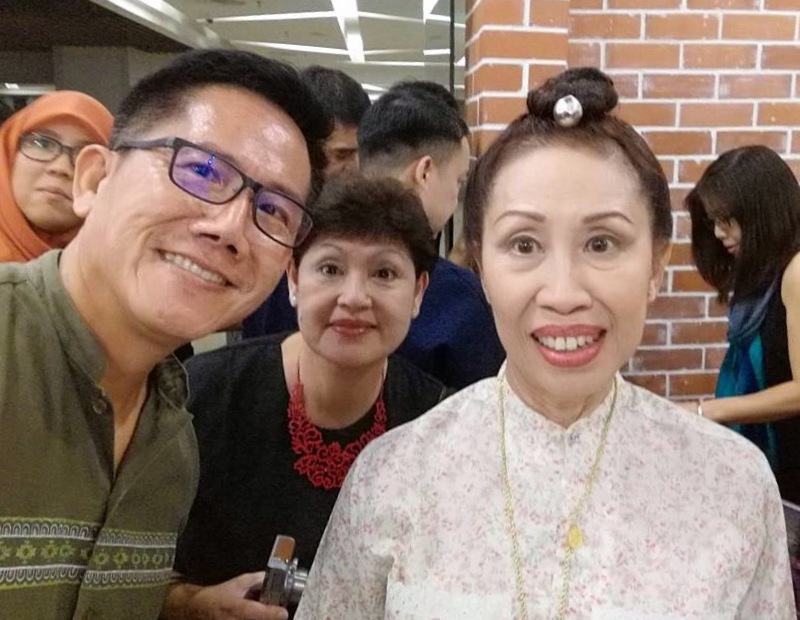 At about 6.30pm on Oct 15, I received a phone message from him saying, “I’m already here…” I was just glad I was on my way to join him to celebrate the 200th performance by Pearlly Chua! While Sulaiman is personally acquainted with Pearlly, my connection is how she shares a similar name as my middle sister, Pearly, spelled with one less ‘l’. She lives in Negeri Sembilan but Pearlly was born in Singapore and grew up in Kulai, Johor, where her father worked in the Malaysian Civil Service. This is her Johor link! When I arrived at the Play Haus, a small crowd of Emily fans had gathered in the adjacent café, mingling and savouring a range of popular kueh prepared in Peranakan recipes. Some ladies were elegantly dressed in Nyonya kebaya and I soon spotted Sulaiman, enjoying the refreshments with his other guests, Madihah and Sara Amelia, his fellow hobby mates in Team Treximo, a running group. This was the start of a most entertaining and engaging evening. When the play was first staged with Pearlly Chua in the role as Emily, it was directed by the venerable Chin San Sooi. Their collaboration took the play to Singapore, Canada, China and Australia. It was therefore, deeply significant that San Sooi was once again, Director as well as Producer for her 200th show! Over the years they have performed the play repeatedly but each show still engaged the audience in a most profound way. 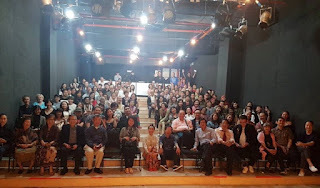 When Sulaiman introduced me to San Sooi, saying that I’m from Johor, I somehow echoed his sentiment that, “The world needs to see the play,” when I asked him to consider bringing Emily of Emerald Hill to Johor Baru. I believe the time is ripe for the staging of such a show for the theatre-performing arts audience in JB. For far too long, we have been going abroad or crossing the causeway to enjoy a good show and it’s about time for the good shows to come to JB! Then it was time for the show. When San Sooi had made a brief introduction to the play, he also acknowledged the presence of the play’s former producers who had come from as far as Australia to grace Pearlly Chua 200th performance. As the hall lights dimmed and the stage lit up, I sat enthralled by the play, set in the living room of a traditional Peranakan home, where the actress engaged the audience with her storytelling, moving around the stage and stretching our imagination with the use of only a few props. It was the era of landline telephones (with a circular dial!) in a wealthy household where they were served by maids, a driver and a gardener. Emily mesmerized us with her stories where we learnt, among other things, that she was a 14-year old bride married to a man twice her age, her bullying in-laws, a wayward husband and her love for her children. At the close of Part One, I managed to swallow rising tears but I distinctly heard sniffing nearby, in an audience quite overcome with the emotions that Emily evoked in us. In a chat with San Sooi during the 15-minute intermission, I learnt that Part Two of the play was even, and I quote: “meatier” and eagerly anticipated the scenes that were about to unfold. While Part One closed on a serious note, the audience was probably unrepared for the change of tone in the opening scene of Part Two. Emily, then the family matriarch, was at the market and when she stepped off the stage to ‘talk’ to the market vendors, her enthusiastic yells caught the audience by surprise and we responded with roars of laughter! Such was the ethos and pathos woven into a tale on the life of a Peranakan woman in that era, beautifully written by Stella Kon and so classically portrayed by Pearlly Chua. Emily was just one lead character who introduced various other personalities to us in her monologue and held the audience captive from the very start to the very end of the entire play. Thanks Sulaiman, for inviting me to the 200th show! She showed us various facets of true life – mirrored in our own lives – and left us pondering about her attitude, behavior and decisions – whether right or wrong – and its consequences, through a woman in a traditional Peranakan family, in a bygone era. As the lights dimmed on a fading Emily, the audience gave Pearlly a standing ovation with loud claps and whistles as she humbly took her bows. Someone passed her a microphone to speak and I observed how she was suddenly speechless, choked up with tears of joy. It was a few moments before she composed herself enough to say a few words of warm appreciation and then the cheering continued. While its part of the actors’ profession to immerse themselves in their roles, I found it difficult to separate the actress Pearlly from her role as Emily! With the resounding success of the 200th show, now it’s time to think about her 201st show and beyond. When I think about Pip and Magwitch, characters in Great Expectations, a novel by Charles Dickens published in 1861, it’s not too far-fetched to find a parallel in how I too was blessed by my benefactors. Pip was an orphan who lived with an abusive sister and her blacksmith husband. He was an unhappy child and often played in the churchyard, close to his parents’ tombstones. While he was there, young Pip met Magwitch, an escaped convict. The story unfolds with an anonymous patron and benefactor whose generosity lifted Pip out of his miserable circumstances and moved him to London where he was groomed into an educated gentleman. All the while Pip thought that his benefactor was the eccentric Miss Havisham (who kept her wedding gown on after she was left at the altar on her wedding day!) so he was shocked to discover that his mysterious benefactor was in fact, Magwitch! Throughout the journey to the birth of my book, My Johor Stories: True Tales, Real People, Rich Heritage, I met with people with big hearts and the goodwill I received from their kindness and generosity was just overwhelming. It started with the grant sponsorship from Think City. This was followed by the advance order for 500 books by Member of Parliament for Johor Baru, Tan Sri Shahrir Abdul Samad. This said a great deal about his confidence in me because even before he saw the Contents in my book, the order was placed! Looking back to the early stages of my book project, I remember working furiously on the manuscript to meet the Milestones agreed with Think City. When I was close to completing my second Milestone, I remember thinking seriously about how my book would be distributed and praying earnestly for a solution. Meanwhile Think City was talking to distributors – mostly based in Kuala Lumpur –but they had yet to revert about the progress of their pursuits. Unlike other books that had a niche audience, for example a book on say, diving sites in Johor, such books had a natural distribution channel to diving clubs, schools and enthusiasts. My book, however, was for a wider reading audience and for weeks, while I wondered how it was going to be distributed, I prayed without ceasing. Around this time our missionary friends, Mr & Mrs Cheong, Whye Choon and Swee Gim, were visiting our church from Kuala Lumpur. Over dinner, they asked about the latest happenings in my life so I shared with them about my book project and how it was coming together beautifully. With the final manuscript almost ready, I needed a publisher to help with the book distribution. After Swee Gim conferred with her husband about their friend who’s in publishing, they proposed to share with him about my project to see how he may be able to help. She asked me to send her the relevant info about my project to share with her friend. At this point, I had no idea who their friend was. I read and re-read the email, pausing at the phrase – my CEO – and praised God for answering my prayers with this amazing turn of events! When Swee Gim said she would share about my book project with her friend in publishing, she never hinted that this friend was the MPH Group chief executive officer, Datuk Ng Tieh Chuan! I later learnt that Datuk Ng and Swee Gim were friends in Taiping since their days in Youth Fellowship and remained in touch even after they moved to work in KL. I couldn’t help but recalled the Great Expectations story and saw the parallel in how Swee Gim and Datuk Ng were a blessing to me, just as Magwitch was to Pip! At first Datuk Ng was like an anonymous benefactor but all was revealed when I received that email from MPH Publishing. From his intuition and experience in this industry, I guess Datuk Ng probably recognized how readers could identify with the local flavour of my book and gave a local writer like me, the platform to showcase My Johor Stories: True Tales, Real People, Rich Heritage. Even as I’m grateful for the partnership with MPH, no one – not even me – ever guessed how well my book would be received by readers. In fact, readers are still seeking me out to autograph their books, not only for themselves but to present to others as gifts! meeting for me to autograph! When I met Sze Mei at MPH 1Utama last Saturday for the Meet-the-Readers event in KL, I was delighted with her update that in addition to MPH bookstores nationwide and online, my book is now also available at Borders and Kinokuniya bookstores! With the presence of an encouraging Saturday afternoon crowd, the Meet-the-Readers event at MPH 1Utama went very well. Little did I know that Sze Mei was then keeping Datuk Ng informed of the event happenings through her photos and short videos! At the close of the event, I was happy to autograph a hardcover copy of my book for Sze Mei to present to Datuk Ng later. On Sunday morning, together with the Cheong’s, my family and I went to church where we met with Datuk Ng and his wife. It was a special moment for me when I finally shook his hand and personally thanked him for the privilege to publish my book with MPH. I was deeply humbled when Datuk Ng apologized for not being able to attend my book launch in JB and assured me that he will be there for the launch of my next book! Next book? My head was still spinning from the exciting thought of working on a sequel as we proceeded to the foyer for morning coffee. I’m ever grateful for the support and partnership of MPH and especially for readers who have kept My Johor Stories: True Tales, Real People, Rich Heritage on the MPH Non-Fiction Bestsellers list since my book was launched in mid-July. THANK YOU!